For the second year we've done Thanksgiving a little untraditionally. Instead of sitting down to a meal with guests at a specific time. We've created a Thanksgiving Open House Party. We put out food from 9am until the last person leaves, this year that was around 11pm. I was so happily preoccupied with cooking, eating and chatting with friends and family I neglected taking hardly any pictures at all. But I'm blessed to report we had more than 35 people come share part of their day with us. For the second year I roasted a large maple-brined, bacon-butter rubbed, bacon-wrapped turkey. I was able to snap a picture of my man slicing her, with the grain. Ooops. Luckily we learned and sliced the second breast the correct way. I'm a vegetarian so I'll take the word of the carnivores that the cut made a great bird taste even better. The only other food I snapped a picture of was the cranberry sauce. I blame the tasty spread for distracting me from my camera. I've never eaten cranberry sauce so I can't personally vouch for this but I was told it was great, like candy. Even though you can spot the canned cranberry jelly in the background of the turkey picture, no one touched it, favoring the homemade. Stir together sugar, port and water in a heavy saucepan until blended. Add cranberries; bring to a boil and cook over medium-high heat, stirring often, 8 to 10 minutes, until skins are split. Remove from heat and let cool 15 minutes. Pulse cranberry mixture in a food processor or with an immersion blender until almost completely puréed. Stir in Grand Marnier. Cover and chill overnight. Can be served chilled or at room temperature. Yields: 3-1/2 Cups. 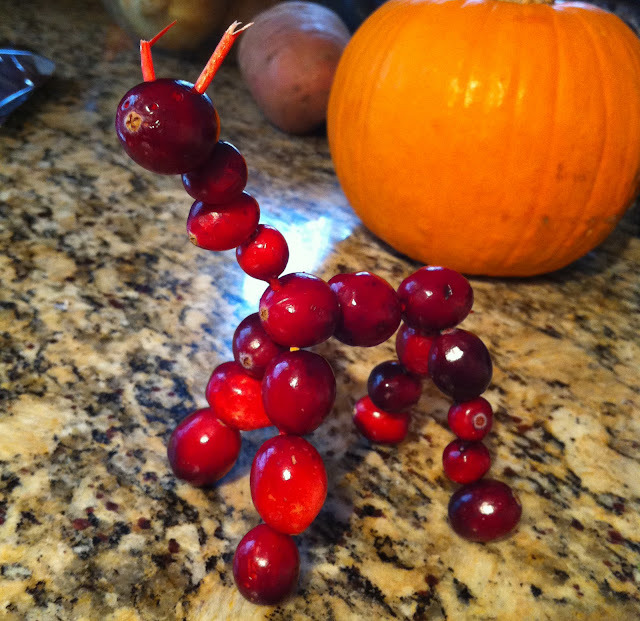 Thing One used the extra berries to make The Cranberry Giraffe. A great hit of the day with the many kids we had coming through were the marshmallows. 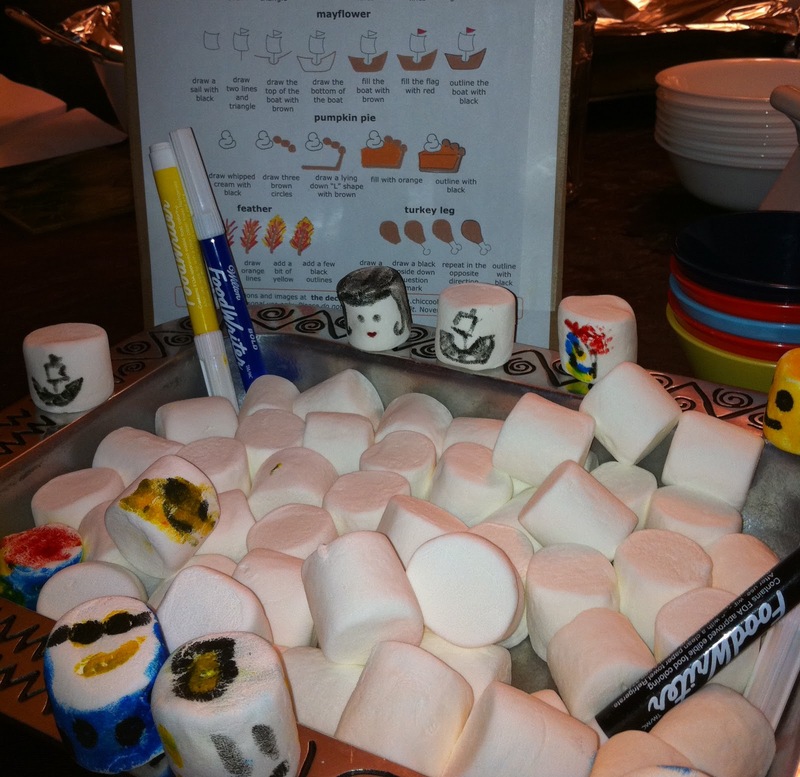 Wednesday I came across this blog post about coloring Thanksgiving marshmallows. I tossed two bags of marshmallows in a large dish Wednesday night so they would dry out a little by Thursday. I put my edible markers in the bowl. Last I printed her instructions out and taped it to a piece of chipboard to stand up behind the marshmallows. Every kid, and many adults, loved being able to draw on food and eat it. Even the shiest little ones warmed up fast with this introduction. I'll definitely be doing this for future parties with kids. My son declared this the Best Thanksgiving Ever! If we are able to continue hosting this full day of enjoying food, friends and family I can only hope I'll hear that every year. Chocolate Butter Cookies with Umph! Wishing You a Very Merry Christmas and Happy Holidays!! Don't take life too seriously, no one gets out alive. So don't take me too seriously either.